How to use custom font “Montserrat” in iOS 7? 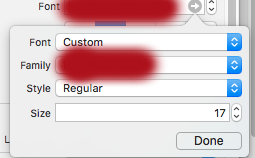 I'm developing an application and I have to use a custom Font Family Name : Montserrat in my app.So can anyone help me how to do this? Category the UIFont class to apply this font every that you want to change. Drag and drop the custom font family with style into your project. After that we can easily check the family in the Interface Builder->Show the Attribute Inspector. You can also check whether the font family file is added or not by put this code into your project. Not the answer you're looking for? Browse other questions tagged xcode ios7 uifont or ask your own question. How to add custom fonts to an iPhone app?